It is funny how a story can grab you right from the beginning and you really can't say why. Not because the writing isn't good, because it was, nor because the characters weren't quirky and lovable, because again, they were. But just because for whatever reason, the story, while not completely original but totally unique in design, was just so much fun to read and had you eagerly turning the pages. That is what book one, Compulsion, did for me. 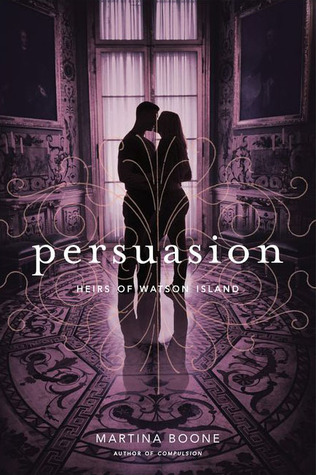 So it was without a second thought, that I picked up Persuasion, and dived right in. I was ready for more Berrie and Eight and all the crazy happenings that went along with them and Watson Island. I was not disappointed. The danger is greater, the risks are higher, and the secrets are more hurtful, deadly, and in overabundance. I absolutely loved how strong Berrie is getting. How determined to do what is right, regardless of the consequences and regardless of who she is helping. But most of all, I love Eight and Berrie together, but sadly, Berrie being Berrie, is also what tears them apart and it was sad to see so much arguing, anger, and hurt happening between these two but it was also completely understandable. More than anything, the atmosphere of Watson Island, with it's magic and curses, hoodoo and voodoo, is what really makes this novel shine. I love the lore, the mystery and the dark mysterious and sometimes gothic setting of the island. It truly screams out to me and makes me crave more. I loved where this whole series is going and I wasn't quite ready for it to end, no matter how painful that ending was. I want so much for the Watson's and the Beaufort's and I truly truly hope, they all get their happily every after. Boone once again enchanted me with her writing, her ability to paint a beautiful dark scene and her talent for making it all stand out, stand up, and shine. Nope not a retelling at all so no idea on the titles LOL! I put the first one on my mighty wishlist, so fingers crossed for a price drop. lol. This really does look like a great series. I seen this one but I was unsure sounds like something to be sure about. Sounds like a great time, and for goodness sake how do you manage to read so much? I feel like I used to be able to manage that so much better. I didn't get into the first book for some reason, but I'm really glad that this series is going strongly for you. You seem like you were really invested. They are for sure but I know there is still so much left undone so hopefully the last book will be amazing too! I haven't read these! Not surprising though - I'm bad with keeping up with new titles and series. haha Thanks for sharing your thoughts though. I'm glad you really liked this one! I love fantasy, looks like a winner Ali! I don;t know why I didn't get this one, I didn't see it up on the sites, and I forgot about it. I enjoyed the first one, and I remember liking the mystery surrounding the families and the island, I will have to try and work it in. "The danger is greater, the risks are higher, and the secrets are more hurtful, deadly, and in overabundance." Ooooh you are making me want to pick up a copy of book one ASAP! I have promised myself I won't pick up any new series until I finish a few first. I am so tempted, though! Gah! I know how you feel. I tell myself that all the time too but it still doesn't stop me LOL! I am terrible! I really loved the atmosphere of the first book. I can't wait to read this one! I love when book 2 just elevates everything from book 1. Sounds exciting. I was hesitant of trying this series before because trusted friends gave it negative reviews left and right, but hey, how many times what I gave in to these books anyway and loved them despite the one stars? I think this may be right my alley because I love quirky, I love lore, and I love a good atmosphere! I gotta read this at some point, I love books that has this type of atmosphere. I hope you do and that you like it! Oh yes it's great to have a story like that mainly when it's a second book. I'm curious about it, it's the second time I see it today. I plan to listen to this on audio, but I recommended it today so I am glad you enjoyed it! aww is this a duology? Nope. I think it will be a trilogy. I hate all of the unnecessary drama in a book. I've been meaning to read the first one, sounds like it's a good one. I'm on a light novel kick at the moment though. This might have more drama in it then you would want then but I still think you would like them. They are kind of fluff paranormal though if that makes sense? I hope you do, it is a fun one. I am not sure if I know about this series, although knowing me the first one could already be on my wish list. Sounds like a good series to dive into, as you put it! I actually love it when that happens Lorna, one less book for me to buy LOL!